Tokyo National Research Institute for Cultural Properties has been engaged in technical cooperation with the Authority for the Protection and Management of Angkor and the Region of Siem Reap (APSARA) for the project to conserve and manage Ta Nei Temple in Cambodia. From August 20th to October 7th, 2018, the fourth archaeological investigation was conducted. With the cooperation of staff from APSARA, the archaeological investigation was carried out at the terrace structure on the upper surface of the embankment of the East Baray reservoir discovered thus far. In addition, the approach, which is expected to have existed between the terrace structure and the east gate of the temple, was also investigated. As for the terrace structure, because of the extension of the investigation area to the west, the west wing, which measures 6 meters east to west and 2.5 meters north to south, was unearthed; this was in addition to the east wing discovered last year. Although the upper stone materials were missing, the foundation existed in all circumferences. 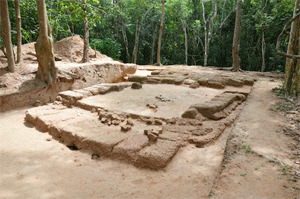 This discovery resulted in clarifying the fact that the structure is 18 meters in scale from east to west. According to a parallel case, the original terrace structure was assumed to be cross-shaped along with the north and south wings, which are still unexcavated. Further excavation should provide evidence that backs up this speculation. As for the approach, we attempted to clarify its width and the condition of its sides by further expanding the 2017 investigation area. This resulted in revealing the fact that the approach is approximately 11 meters in width and that certain facilities might have existed on both sides, which are around 50 centimeters higher than the approach. We are planning to prepare explanation boards for tourists visiting the site. In parallel with the academic investigation, we will also proceed with establishing a management system for access and utilization.